CNC machined and Hard Anodised. Default Color: Red As Pictures. And Feel Free to Contact Us ! ★[QUANTITY] - 1 * Chain Guide As Pictures,Installation Instruction NOT Included. 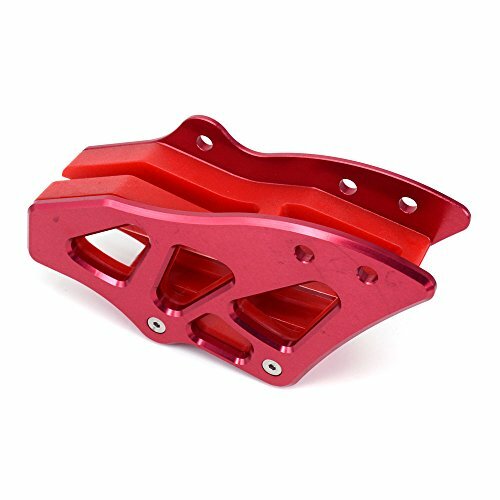 ★[FUNCTION] - Replace fragile stock chain guides with these rugged aluminum guides. ★[HIGH QUALITY] - 100% Brand New, Never Mounted.CNC machined and Hard Anodised.Very Strong, Light And Durable.Rub blocks are made from ultra high molecular weight polyethylene for long wear . ★[AFTER SALE] - Manufacturer warranty for 90 days from date of purchase.We are committed to provide excellent customer service,If you have any questions,please contact us.We will try our best to solve your problem. If you have any questions about this product by AnXin, contact us by completing and submitting the form below. If you are looking for a specif part number, please include it with your message.